This is a sponsored post on behalf of Tatu Digital Media. Have you heard about Happy Cards? It's the hot new no fee gift card available at select Kroger stores..Select your Happy Card and fill it with from $20 to $500 for your favorite guy or for the whole family. Perhaps you want it for yourself? This is a great way to treat yourself! Shop with your Happy Card at select merchants, including: McCormick & Schmick's, Brio, Texas de Brazil, Cheesecake Factory, Red Lobster, Bravo! Dell, AutoZone, Lord & Taylor, Burger King, Buffalo Wild Wings, The Home Depot,Lord & Taylor, Sephora, Bed Bath & Beyond, Saks Fifth Avenue OFF 5TH, Panera Bread, Spafinder and more! You can buy a Happy Card with Cash, debit card or credit card. I really like that I can have one card to use at so many places. I am a gift card junkie. I love getting them and I love gifting the,. Have one card that I can use at many places, help reduce the clutter in my purse. Okay, I have a confession to make. Ready? I carry all my gift cards in a Ziplock bag! I know, I know. That is ridiculous! I am so happy I can now get the Happy Card and eliminate all these gift cards. I can put ONE gift card in my wallet instead of carrying around this bag of cards. I also think the Happy Card is great to give as a gift. The recipient can use at so many different retailers whether it be for food, a spa day, or auto parts. This would make a great gift for anyone on your gift list! Check out more by visiting www.happycard.com. Happy Card makes gift giving so much easier. This will definitely be my go-to gift card for those on my gift list. As I told you above, Happy Cards are only at select Kroger stores. And, when you purchase a Happy Card, this counts towards your fuel perks at Kroger. HELLO! That means saving on gas. I see this as a win-win situation.. Not only can I use my gift card at so many different places, it counts towards my fuel perks! Even if you gift the Happy Card, YOU still get the fuel perks. So, that is an added bonus when you chose to make Happy Card a gift to someone. 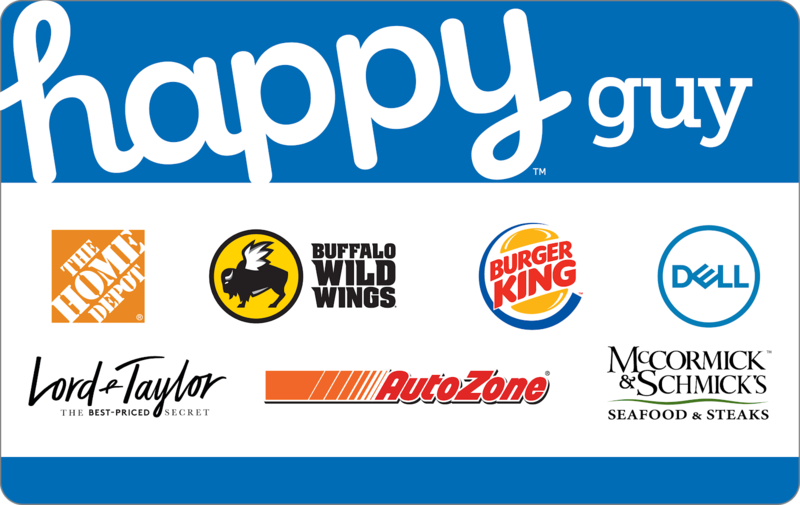 Check out the select Kroger locations for Happy Card HERE! Terms and conditions apply. I think the idea of combing so many store on one gift guide is genius. I am heading to Kroger to buy one for myself and several for gifting. I am so happy that my purchases will also earn me fuel rewards. I suggest picking up an extra Happy Card for that unexpected gift that may come up! And,now for the giveaway! I am excited to partner with Happy Card to giveaway a $50 Visa Gift Card! Make sure to complete all entries to increase your chances of winning. The winner will be selected by the sponsor and the sponsor will contact and ship directly to the winner! Good luck to all my fantastic readers.